Yet now with the urgency of climate change, forests are no longer ‘nice to have.’ They are essential to our survival. The Paris Climate Agreement emphasises that increases in carbon stocks are urgently needed to limit global warming to ‘well below 2 degrees’ and to reach a balance between sources of emissions and carbon sinks in the second half of the century. I could see these dynamics play out before my eyes during a visit to BaumInvest’s reforestation project in Costa Rica’s Heredia province, led by Puro Verde and supported by Futuro Verde. Even before seeing the project site it was clear that the Puro Verde team were closely integrated in the community. At the office headquarters, local parents were in the nursery, packaging saplings with their kids watching on. A range of light construction equipment that was used for project purposes was also made available to anyone in the community who might need it for their own personal or commercial pursuits. Preparing saplings is a family affair. As we drove to reforested areas of Finca San Rafael, just as we turned right onto a bumpy unpaved road, the skies opened with a thumping rain storm. A woman with a small child with bright fawn-like eyes had been walking along the road. Without hesitating, our host Roberto Martinez pulled over and invited them into the truck, saving them a 3- kilometre trudge through mud. This sort of unspoken trust and camaraderie was clear in many exchanges with locals. Further along the road, we noticed a few random cows grazing among sparse trees for some time, highlighting the original cause of deforestation in the area. Soon the forest grows more dense, but with some visual regularity. You detect that this is not an old growth forest. But it’s certainly not a single species checker board that you can spot from miles away. As opposed to a monoculture approach, BaumInvest and Puro Verde are planting a range of predominantly (85%) native species, more than 20 in all. 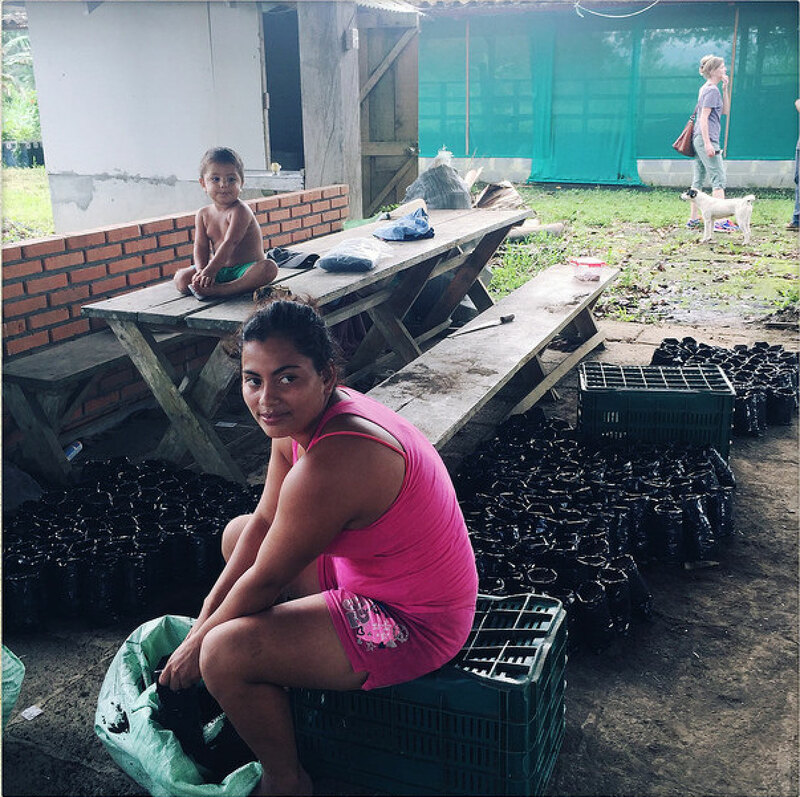 Local people can also plant ginger, cocoa or vanilla between the rows of trees and then market those crops with Futuro Verde’s support. A true intersection of natural and social capital creation. Crops are planted in small test farms at the Puro Verde headquarters. The work at Finca San Rafael is clearly not just about planting trees and coming back to measure every now and again. The project site is ongoing experimentation. 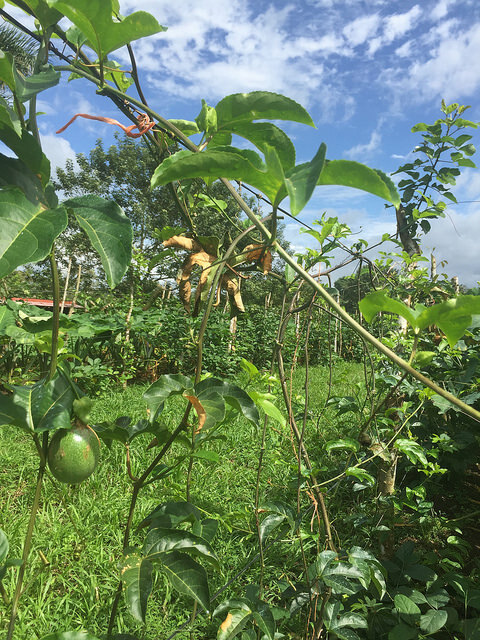 A local garden serves as a testing site to see which crops and planting combinations could be more resistant to extreme weather conditions or to pests that may arrive with changing climatic patterns. They are committed to continuous learning about what species of trees and techniques works best under particular conditions to boost carbon stores. Or how planting certain species together may help keep trees healthy. 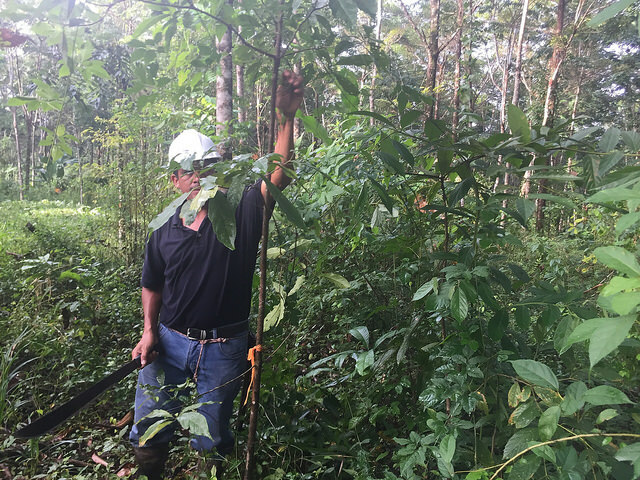 The Puro Verde team observes growing carbon stocks. Their ingenuity has been noticed, too. 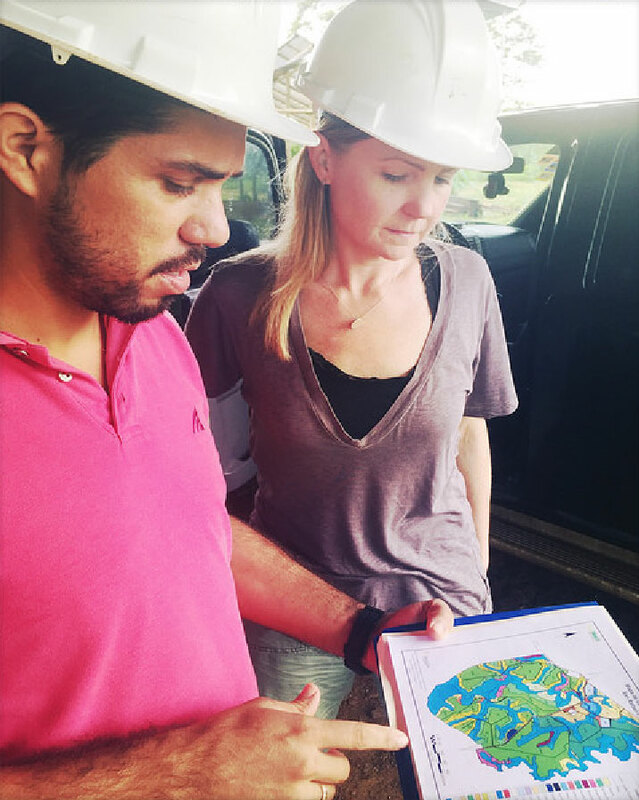 The guys on the ground regularly host researchers to share their results and insights for restoring natural habitats. Just the week before we arrived, fellows visited from the World Resources Institute, the Association for Tropical Biology and Conservation, and the University of Connecticut. The team is hungry to share what they’ve learned with other developers as well. Roberto and his colleague Delvis Angulo mentioned numerous times how they wish there were an accessible learning portal where they could contribute critical lessons learned to allow other developers to leapfrog from experimentation to most efficient methods. Something for Gold Standard to consider as we build out our network engagement platform. Delvis shares with me their current footprint and plans for growth. All of this project’s remarkable achievements left me feeling enlightened and inspired, but also concerned about its future. There remain questions about how the voluntary carbon market can and should operate in the post-Paris Agreement world. Forests are included in Costa Rica’s Nationally Determined Contribution. Will Costa Rica continue to allow its carbon reductions to be exported post-2020? What about five years after that? Will this project still be able to benefit from support from companies looking to finance emission reductions? Carbon markets have been brilliant at ensuring good governance, robust monitoring, reporting and verification (MRV), and channeling finance from polluters to carbon reduction projects on the ground. But as the rules for the Paris Agreement are being written, how will we provide the right incentives to ensure the conservation of forests, and doing so in a way that supports sustainable development? Can new instruments be developed to serve as a similar mechanism, perhaps made even more efficient and effective with satellite monitoring, confidence levels calibrated to the sensitivity required for reporting rather than trading financial instruments? Beyond international cooperation, how can we embed mechanisms into products and services such that forest conservation and emissions reductions become part of business-as-usual? These are the questions Gold Standard will be pursuing as we work toward future-proofing voluntary carbon markets for a post-2020 world, with support from the German Ministry of the Environment. Carbon sinks are critical to meeting the ambition of the Paris Agreement, not to mention how forests can contribute to delivering on many additional Sustainable Development Goals. Let’s challenge ourselves to find new and improved ways to incentivise and reward the creation and maintenance of healthy forest ecosystems that support prosperous communities the world over.